300 Dollar Wonder: Alarmist Much? Yep, that's right. Not only do we need to worry about Tom Hanks destroying our nation's relationship with God, we're facing an economic meltdown due to a movie by Al Gore. Not 'Tax-cut and Spend' President Bush's skyrocketing deficits. Not the president's wars and saber rattling - and corresponding jumps in oil prices. Not the Republican in control of all three branches of government. 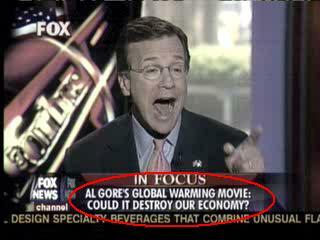 It's all Al Gore's fault. Steve Forbes answer: "It will ice the economy. And after all, some people do believe the DiVinci Code, so some will believe the DiGore Code. [Laughter] But the fact of the matter is, the policies that result from it would hurt the economy, would create unemployment. It's a real recipe for more socialist regulation." Finders Fee to Think Progress.